The house has 5 comfortable rooms with high roofs. Room number 1 is set in a Venetian Style while room number 2 has an elegant Luis XVI furniture, both have old design bathrooms decorated with sea motifs. Room number 3 is decked out with pieces of furniture inspired in the 50s, it has a large restored bathroom and a big painting from the local artist Juan Ramón Valdés Gómez (Yiki). Room number 4 has a Luis XV décor, it also possesses a beautiful stained glass window and a small sitting room furnished with wicker fittings (“Diana style”), it is adorned with a wide collection of contemporary and ancient paintings made by Cuban and foreign artists. The rest of the house is exquisitely decorated with collections of paintings, lamps, porcelains, crystal and bronze ornaments. The living room has beautiful mosaics imported from Italy and an impressive Luis XV style furniture which belonged to the famous Cuban poet Dulce María Loynaz rewarded with the Cervantes Literature Award. There is a spacious central patio surrounded by a corridor and a graceful colonnade with pleasing ornamental plants, a bower that offers visitors a place to relax and an ancient fountain which is not only a beautiful ornament but also represents the distinctive marc of the house. 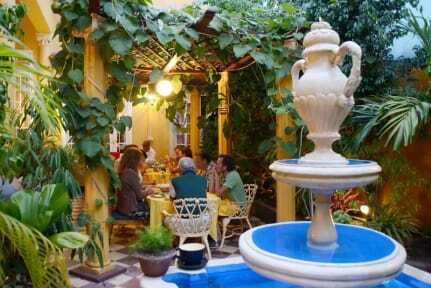 Hostal D´ Cordero is placed in a quiet secure zone away from the city traffic and near to essential places where visitor can appreciate our local and national culture, 150 m away from the Leoncio Vidal park. 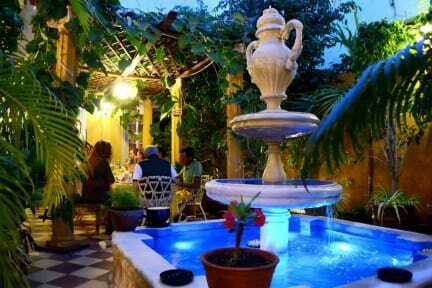 Hostal D´ Cordero has four private rooms and it is capable of accommodating 14 guests. Each has natural ventilation and air conditioning, TV / DVD, minibar and private bathroom with hot and cold water, hair dryer, umbrella, safe-deposit box, electric current 110v and 220v and all the accommodations to assure everyone´s needs.